Squat Thrust Ladder Assessment: All athletes begin at Level 1 and progress as far as possible up the ladder. Level 1 commences with 10 squat thrusts which must be completed in one minute. The athlete works through the repetitions as quickly as they wish – with the remainder of the minute as a rest period. If the athlete is able to complete the prescribed number of squat thrusts within the minute they will move immediately to the next level. 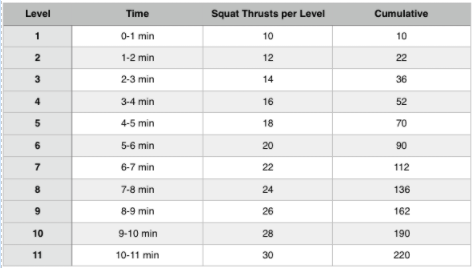 In this case the athlete would move to Level 2, which is 12 squat thrusts in one minute. If this is completed, then the athlete moves to Level 3 and 14 squat thrusts, then Level 4 and 16 squat thrusts, then Level 5 and 18 squat thrusts…and so on until they are unable to complete the prescribed repetitions in a minute. The athlete is then scored on the cumulative number of squat thrusts preformed.